Indian River freshman Izzy Binko (center) drives up the field during a game earlier this season against Sussex Academy. Binko scored the game-winning goal for the Indians in their 2-1 quarterfinal win over Caravel Academy in the DIAA state playoffs last week. 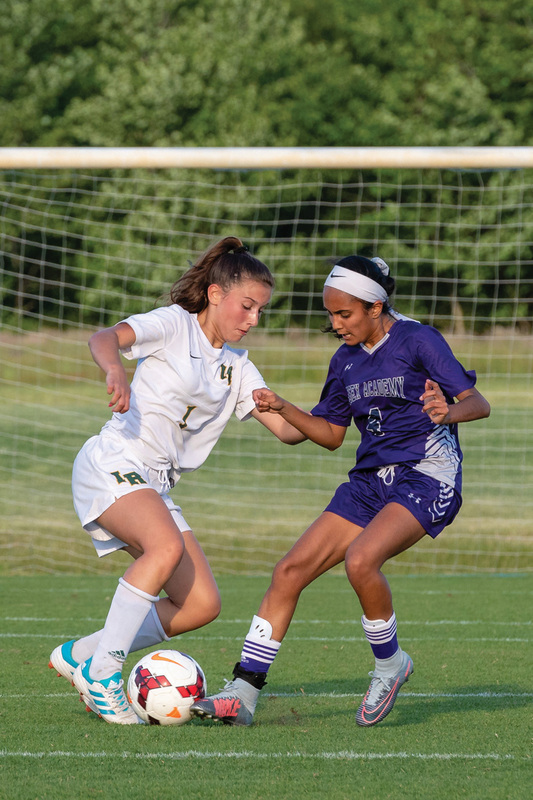 Sia Diakos tries to elude a defender during the same game. Diakos scored the first goal of the game for IR against Caravel. 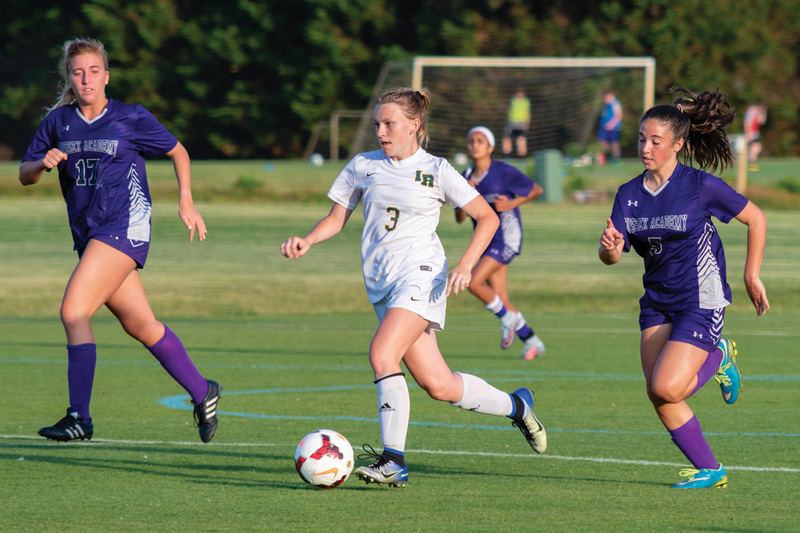 The Indian River High School girls’ soccer team had little time to dwell on their disappointing Henlopen Conference Championship loss to Caesar Rodney on May 17. That was because 48 hours later they were back on the field, opening their DIAA Division II state playoffs run. After a 2-0 shutout win over Mt. Pleasant, the Indians faced No. 3 seed Caravel Academy, which posed a tough test against a team that went 11-4 during the regular season. Sia Diakos’ goal — on a feed from Grace Engel — at the 8:23 mark of the first half got the Indians on the board and put the Buccaneers on their heels. The Indians and goalie Fabrea McCray kept the Buccaneers off the scoreboard until the 51:52 mark of the second half, when Samantha Cooper slid one into the goal to tie the game at 1-1. Neither team was able to find paydirt over the final 18 minutes of regulation, and overtime was needed to decide this one. At the 86:10 mark, as she has done all year, and like her freshman counterpart, Izzy Binko rescued the Indians by drilling home a pass from Sammy Whelen to move IR into the semifinals against the Delaware Military Academy team on Wednesday night, after Coastal Point press time. Results and highlights from the game can be found on the Coastal Point sports Facebook and Twitter pages. In the May 24 game, Caravel out-shot the Indians 22-14, and corner kick opportunities were even, with two each. McCray finished with 14 saves on the afternoon, while Caravel’s Sydney Keld turned aside nine Indians shots. The loss ended the Buccaneers’ season at 11-5, while the 6th-seeded Indians improved their 2018 campaign record to 12-5.